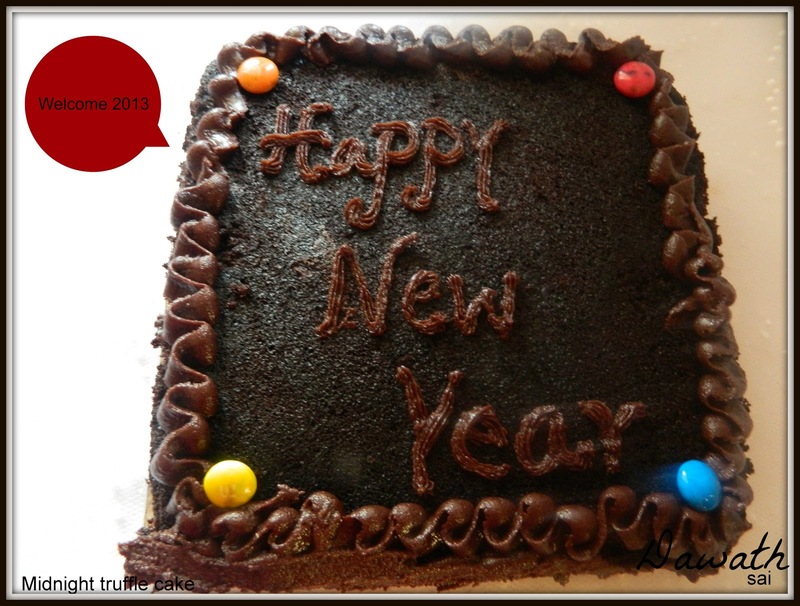 WELCOME 2013!…Cake!Cake!Yes,one more cake.What better way to celebrate and welcome new year than this beautiful cake.Well,well, this cake was exclusively baked for experimenting the cake decoration.My childhood baker buddy L, who presently lives in Botswana,has come down to Mangalore and guess what is our daily discussion about,yes it is cakes,bakes and makes,lol .We talk only about cakes,cake tins, cake ingredients and cake decoration.Well, I have learnt a lot from her on baking .She asked me to keep a cake ready coz she was expected to be at our place the next day and I wanted to bake something new which I hadn’t baked before and my vision fell on this beautiful cake baked by my FB friend Rajni Kamath in a FB food group and I decided this is it.The cake came out very good,soft and moist.Thanks Rajni for this wonderful recipe….With great difficulty I protected the cake for almost 3/4 th day,uffffff,lol,also had to bear my daughters kitpit as usual ,that why I didn’t bake 2 cakes and blah, blah ,lol. Well, finally Lakshmi arrived at our place on the D day,both of us enjoyed our exclusive seafood lunch with some chitchat ….. she put her gondu baby boy asleep,left him on her daughter raksha’s and my kids care and we immediately started our job. I took out the leftover chocolate buttercream icing from the fridge which was waiting for me since a long time and started my icing adventure….We had a very short time to experiment with other things since her bundle of joy,7 month old Rishab woke up.But no problem,learnt the basic things and there is whole life left to learn many more…Since this is my first icing experience thought of posting this to make a new start, that is to welcome the year 2013.HAPPY NEW YEAR DEAR FRIENDS! Sieve maida,baking powder and baking soda and keep it aside. Place sugar and eggs in a bowl and beat it with an electric beater till slightly thick and frothy and light in color. Add oil and mix steadily, then add boiling water and mix for 45 seconds. Now slowly add sieved maida mixture little by little and adjust the speed to medium and beat for few minutes. Now add the cocoa powder and mix it. Pre heat the oven at 180 deg F for 15 minutes and bake for 40 minutes. We just halved the cake into two pieces and applied the chocolate buttercream icing and sandwiched the pieces,then did some icing. Love the dark colour,love chocolate cakes any day!